Have you been dreaming about a pickup truck that offers a full-length boxed ladder frame, anti-lock brakes, and forward-facing rear flip-up seats? If so, the pickup truck you've been dreaming about is the 2017 Nissan Frontier available at Vann York Nissan near Winston-Salem, NC. On the new Nissan Frontier SV V6, you'll find a 4.0-liter, 24-valve, V6 engine paired with a 5-speed automatic transmission to accommodate all of your towing, hauling, and payload needs. Climb into the new Frontier PRO-4X and discover a pickup truck with Bilstein shocks, electronic rear differential, skid plates, and NissanConnect to control your navigation system and mobile apps. To test drive a new Nissan Frontier today near Greensboro, NC, contact Vann York Nissan near Winston-Salem, NC, and speak with a sales associate about our selection of new Nissan Frontiers. If you're looking for a truck with skid plates protecting the oil pan and fuel tank, a 4x4 transfer case, and fog lights then you're going to need the new Nissan Frontier PRO-4X. Touring the Frontier SV V6 you'll notice it comes equipped with front tow hook (4x4 only), and a body color front bumper. If you're interested in the chrome grille, then the Frontier S is the truck for you. When you're on the road, do you like your privacy? If so, you'll appreciate the rear privacy glass that comes standard on the new Nissan Frontier. Other standard features worth noting are the locking tailgate and cargo bed light, tailgate spoiler, and front UV-reducing solar glass. Climbing inside the 2017 Frontier, you'll immediately want to take advantage of the illuminated steering wheel-mounted audio controls to command the MP3/WMA CD player and auxiliary audio input jack. If you want to stay connected to your smart device while you go off-road, the USB connection port has you covered when it comes to plugging in your compatible devices. Of course, if wires aren't your thing, stream your audio via Bluetooth wireless technology. If you are thinking about financing, but aren't sure of your credit score, your should fill out and submit our secure, online credit application. After you know the financing options provided by our Nissan dealership, you'll be able to make an educated decision that will lead to you driving home in a new Nissan Frontier from Vann York Nissan. 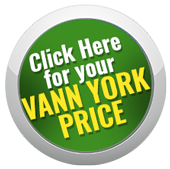 When you want a competitive price on a new Nissan Frontier, visit Vann York Nissan near Winston-Salem, NC, today! Remember, our service department is available to assist you and you can schedule service right here on our website!